Source: I received a copy to facilitate my reviews. The opinions expressed here are my own. 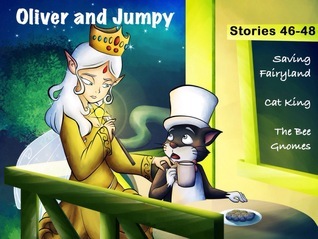 In this story Oliver, Jumpy and Joey visit ghost castle. They find a group of elephants in a desert waiting for them to lead them to fertile ground. Oliver is up for the challenge. They encounter a grass fire and an avalanche. Will they find the land of plenty? 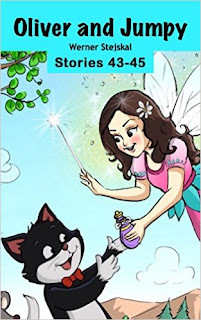 In this story Oliver sets out on his own to break a curse. 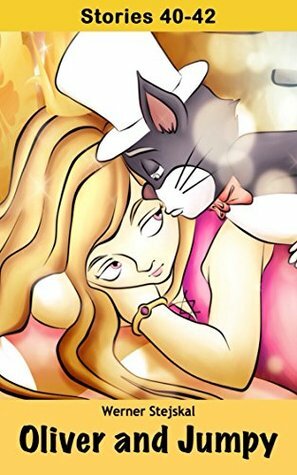 Years before a Princess was put to sleep until a cat Prince could wake her with a kiss. However, the cat prince would have to overcome three challenges. The challenges included a genie out of a bottle, a giant and a spider. Will he be able to wake the Princess? Jumpy and Joey were watching a star in the sky when suddenly it began to move. It became a fireball and landed in their lake. The next morning a spacecraft emerged from the lake. A creature came out. What do you think the creature wants? In this story a stork from Africa delivers a letter to Oliver. He is needed to rescue another princess. He and his friends travel to Africa where they are given a magic carpet to help them rescue the princess. They manage to do this, but the guards chase them. Can they evade the guards and take the Princess to her destination? Oliver returned home from one of his adventures to a surprise birthday party. His friends had cake and presents for him. He felt their love. What kind of presents do you think he got? In this story the three friends visit Ghost Castle again and end up in a land where there were very large berries. Before anyone could stop him, Joey ate a handful. He began to shrink. He found another colored berry and ate it. It caused him to grow fat. He found a third berry and ate it and it caused him to grow tall again, but remain fat. They were told they had to find a wood fairy to help them. Will Joey be able to do what is needed to get back to his regular size? Fairyland was under attack. Their food was being destroyed. The Fairy Queen asked Oliver and his friends to help save her land. With their magic wands they went to help. Will they be able to save fairy land? Oliver and his friends visit the Ghost Castle again for another adventure. They find themselves in a room with several statues. One of them looks just like him. The statues come to life and declare him their returned king. They take him to meet his bride. They get married and begin to eat. There is one major problem. When Oliver eats anything with mice or birds in ti he begins to turn white. The other cats think he is an impostor. What will happen to Oliver and his friends.? Oliver is not the neatest cat. Sometimes his home can be quite messy. One day he woke up and found his house had been tidied up. This happened several mornings. He pretended to go to sleep one night and found out who was cleaning up his house. The bee gnomes had a favor to ask of him. Would he be able to help them?